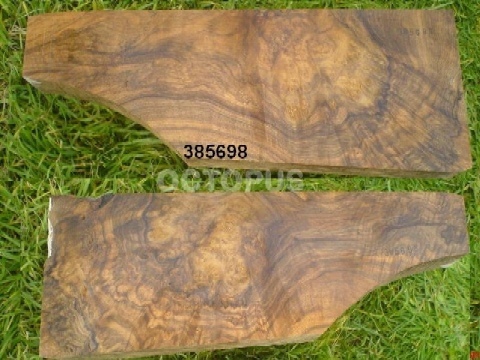 Above, a beautifully figured walnut shotgun blank, yours for 625 Euro from Octopus stock blanks, located in Turkey. Many modern firearms are offered with plastic stocks, synthetic stocks, or stocks generously called composite. This is sometimes presented as an actual benefit over hardwood stocks or laminated stocks. Things are rarely what they seem to be. Synthetic is an imprecise term, meaning only man-made, non-natural, or artificial in common use. Though it stems from synthesis, as in a chemical synthesis, compound, blend, mixture, or cocktail, that sure doesn't tell the consumer anything of value. Though portrayed as desirable, too often synthetic stocks are just the opposite. Often produced only because they are cheap, the generic synthetic stock may lack rigidity, strength, water resistance, chemical resistance, add noise, and have the aesthetically vulgar visible mold lines that are hard on the eyes. Aging studies have been conducted of nylon 66 (yes, the same plastic the Remington Nylon 66 got its name from) situations like smog environments caused the loss of about 63% of its tensile strength after six months. Nylon yarn exposed to humidity lost between 40% and 85% of its strength after six months contingent on temperature. These studies, by Sandia National Laboratories (1982), were of great concern, as Sandia has design responsibilities for weapons systems parachutes, parachutes designed with low (2.0  2.2) service factors. Temperature, ozone, smog, temperature, humidity all may rapidly decay nylon. Various thermoplastics exhibit creep, moisture uptake, outgassing, and other problems associated with humidity and heat. Some of this is seen as beneficial, except not in gunstocks. Shotshell wads, for example, that decay rapidly when exposed to UV light are considered biodegradeable. Not too many people are interested in a gunstock that biodegrades when you are using it, though. There are no absolutes in stocks, but there are generalities. When the goal is price, the plastic stock you get on a value or entry-level gun is going to be made with cost of production in mind. While it may be adequate for some, it is generally the lowest form of riflestock you can acquire. This is regardless of brand, it is just the way it is. We wanted cheap and we got exactly what we said we wanted. Matte, unpolished finishes and cheap tupperware stocks are intrinsic to the value genre of gun. Did we really, honestly think it could be otherwise? Walnut has been a preferred stock material for ages. Properly selected, cured, and inletted walnut stocks are remarkably durable, rigid, and long lasting. For aesthetics and feel, they have no equal. Walnut is also in great demand for furniture, bowls, and as a result of its cost is often used as veneer. Shortage of walnut in times past has forced the use of lesser woods. Even now, the cost of an extremely high-grade shotgun blank, seasoned by three years of drying may cost $850 or more. When want the entire gun for less than the cost of the stock blanks themselves, it isn't hard to see why truly high-grade stock sets are not at all standard fare today. One of the best current alternatives is laminated wood stocks. Formed under high pressure and heat, they are far stronger than generic plastic stocks, do not degrade with exposure to UV and humidity, are more rigid and they promote accuracy as a direct result of that quality. They have only one negative in the minds of many: as glue is used between the strips of wood, they may be heavy compared to thermoplastic stocks and are denser than natural walnut. There are synthetics and then there are composites. Hand-laminated fiberglass cloth stocks (or graphite cloth) stocks as offered by McMillan, for example. The latest, graphite cloth McMillan Hunters Edge stocks run about $578. Strength and quality has a price. There have been improvements that seek to combine affordability with accuracy. The Savage AccuStock is the most noteworthy factory offering in this regard, as the barreled action to stock integrity is unitized by the aluminum bedding block both by action screw attachment and squeezing of the action from the sizes. It is metal to metal fit, eliminating stress and creep to the stock shell itself. There are other aluminum bedding block or chassis type systems as aftermarket, offered by Accurate Innovations in walnut and hardwood laminates and H-S Precision in synthetic composites. Contrary to some popularly held beliefs, molded thermoplastic stocks are by far the worst in terms of strength, accuracy, durability, weather-resistance, and longevity. A look at long range competitive shooting will not show you anything approaching the generic, blow-molded thermoplastic stock. You will see laminated stocks well-represented, though, one very clear demonstration of the desirability of today's laminated stock. Hunting, naturally, is not the same as paper-punching and striving to shave thousandths of an inch isn't at all important or applicable. The target isn't an inch, much less a tenth of an inch. Hunts are not successes or failures based on minutes of angle; minutes of whitetail is a different matter. Chuck Hawks asked the question a while back, to the effect of What is more natural in the woods, anyway? Wood or plastic? Wood is of course an excellent gunstock material, based on strength, density, as well as the overwhelming advantage when it comes to appearance. Our notions of wood as not being durable should be questioned by such vessels as the U.S.S. Constitution, which performed an underway demonstration in late October, 2009, firing shots from her port and starboard batteries to honor the 16 states that comprised America when she was launched . . . in 1797. White pine, longleaf pine, white oak, and southern live oak were used in her construction. Hunting hardly requires the long-term exposure to the elements endured by a 44-gun three masted warship. Though not the cheapest stock material, quality walnut remains the most satisfying. Whatever you decide upon in your personal price-performance ratio, it is always good to consider that something you have to buy twice is no one's bargain. Laminated gunstocks are among the most accurate for the dollar, while walnut stocks or true composite stocks like the McMillan graphite often make the most long-term sense. Personally, I always enjoy the look of well-figured wood, but can hardly get excited about highly polished plastic made by old world craftsmen. For milk jugs and garbage can lids, it is a different story. For a firearm worth keeping, unintentionally biodegradeable plastics are not my first choice. Wood and laminated wood stocks might be a lot better than you think and synthetic stocks just might be a lot worse.